Providing you the best range of pancha boodha yantra, instant prosperity yantra, vedic prosperity pendant, aura enhancer painting and main door entrance energizer with effective & timely delivery. Pancha Boodha Yantra is one of the Most Powerful tools for human wellness creatrd by Siddha Purushas like Agasthya and Bogar. Since the universe is guided by Panch Boodhas, this Yantra is considered the most powerful of all the yantras of the world. 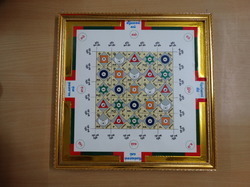 Having this Yantra at Home will do a world of good for the person/family concerned. This Yantra is designed to protect the person from all the evil forces that come from all the Four directions and shower him with all goodness. 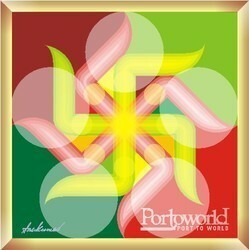 The Most Powerful Yantra Embedded with Very High Prosperity Frequencies. Prosperity being the bottom line requirement of every individual in this World , no wonder everyone is desperately looking into the ways and means of bringing in the much needed prosperity into their lives. Instant Prosperity Yantra is definitely the ultimate answer to this never ending search !........ Yes. This ultimate Prosperity Yantra is quite different in many ways than many others now available in the World. 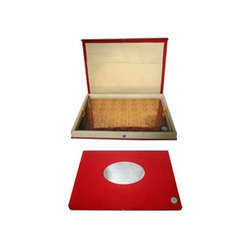 Instant Prosperity Yantra, measuring 12 inches x 8 inches in size, encompasses 4 different most powerful Yantras in one Yantra, thereby making it the most powerful Prosperity Yantra in the World in terms of Prosperity Energy Levels. Most importantly, this Prosperity Yantra is Embedded with very powerful Prosperity Frequencies using our Proprietory Unique Frequency Embedding Technology , thus satisfying the basic frequency principle for every success. Many people who are using this Yantra with absolute faith and sincerity have reported excellent results within few days itself. Many unexpected positive developments and surprises have been reported by the users. It can happen to you too! AFTER DOING THE VASTU-FENGSHUI CORRECTIONS, THIS YANTRA SHOULD BE THE FIRST ITEM TO ENTER YOUR HOUSE FOR REAPING INSTANT PROSPERITY BENEFITS. 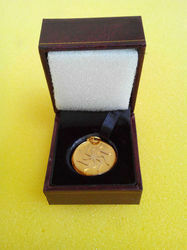 THIS YANTRA WILL BE AN IDEAL MARRIAGE GIFT TOO. This aesthetically crafted Gold coated Pendant is permanently impregnated with 150 Hours of Vedic and Upanishad Mantra chants related to Prosperity, Wealth, Success and Happiness. The Mantra Frequency Embedding is done using a Frequency Embedding Machine imported from USA. Many Offices ,Work places,Hotels etc., experience reduced Positive Energies as the day progresses, because the place may have been infested with Negative Energies left behind by different kinds of visitors. This will ultimately hamper the harmony, productivity and fortunes of the Organization, which no Organization can afford . Therefore in order to keep the Office Reception and work place or a House totally Positive throughout the day, we have created this Most Powerful AURA ENHANCER PAINTING,which generates Positive Energy equivalent to 35 Lakh Bovis Units. The Painting will be sent as a roll / folded and you have to frame and hang it at the appropriate place. According to Hindu Vastu Shastra, the Main Entrance Energy of a House, is considered very important and many rituals are performed at the time of construction of an house, to energize the Main Door Entrance. If the Main Entrance remains energetic , then the house enjoys good luck and prospertity. On the other hand if the Main Entrance is Negative , then the house may not enjoy Prosperity and good luck. Therefore it is very imporant for every House / Office / Factory / Shop to have its main door entrance filled with full of Positive Energy to enjoy Luck and Prosperity. After considerable study and research we have created this MAIN DOOR ENTRANCE ENERGIZER PAD , which when stuck on the Main Door inside the House , spreads enormous POSITIVE ENERGYat the Entrance of the house and prevents any form of Negative Energies entering the house . At the same time it showers into the House enormous PROSPERITY ENERGY for ever. The house immediately becomes ready to enjoy LUCK and PROSPERITY . Stick 3 or 6 Pads on the Inside door for optimum results. The Energizer Pads come with a ready to stick double sided tape. 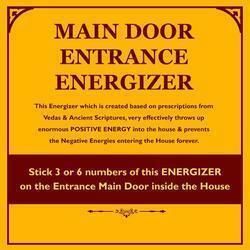 This Main Door Entrance Energizer is created basd on Vedic prescriptions and Ancient Scriptures. In addition, the desired frequencies are impregnated onto this Pad using Frequency Embedding Technology. We guarantee more than 90% Main Door Entrance Energy, if these pads are used. Looking for Prosperity Generators ?